I thought I had put more book reviews up here than I have. Here’s one of the ones I thought I’d posted. At the moment I’m doing a lot on Knowledge Management so here is high praise for Organizing Knowledge: Taxonomies, Knowledge and Organization Effectiveness by Patrick Lambe. Lambe is that rare mix, both a theoretician and a practitioner. The book is solidly based in theory and well-proven by practice. In the first half, Lambe takes you on a readable tour of how people have organised knowledge in the past and compare different approaches (hierarchies vs facets, for examples) and some of the implementations (the Dewey decimal system, and so on). While the second half gives you tools and strategies for defining and introducing taxonomies to an organisation. He doesn’t pretend it is easy, but the tactical tools and the methodological framework are workable. He’s clearly refined them by using them and some of the pain he has felt on the way comes through between the lines. I sympathise with him almost as much as I admire him. The book has the benefit of being fairly short. I’ve noticed this with other books on the subject – perhaps books about online technologies need to get out so fast there’s no time to add padding, or else people dealing with knowledge management think too clearly to waffle. Either way, it’s pricey per page but benefits from its brevity. I cannot recommend this book highly enough if you are working in this area or are responsible for information architecture, knowledge management, or pulling sense out of corporate folksonomies. If you want more from Lambe, he blogs at Green Chameleon. I’m always fascinated by word clouds. When you run somone’s blog through one it’ll show the words they use not the tags they choose. Word clouds are a reality check, an insight into an individual’s subconscious folksonomy. I don’t remember saying Chichester or agriculture but I must have done. And I’d no idea that I was so interested in time. 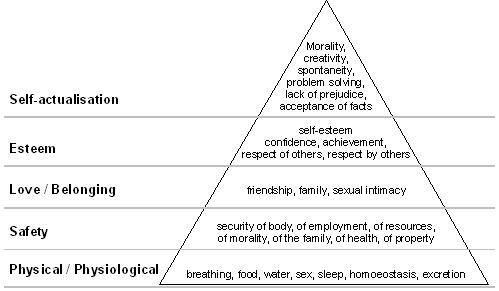 Most of us are familiar with Maslow’s hierarchy of needs which suggests that we prioritise bodily needs over security, our sence of belonging over our own self esteem (which is how peer pressure works) and that we won’t tackle the things that fulfil us until the rest of our needs are met. What is discussed less frequently is that organisations have a similar hierarchy of needs, and that organisational focus shifts in turbulent times. This is a sequence I recognise, in large organisations at least. Mind you, it seems to me that small organisations and entrepreneurs run the sequence in the opposite direction. Maybe that is what makes them entrepreneurs. I’ve not yet read Marchand on the subject (I came across the idea in an excellent book on Taxonomies by Richard Lambe). I need to go to the source to understand the details of he is saying, why he has drawn it like that, and whether or not I agree with him, but this a useful thought-provoker, and may also be helpful tool for working out where strategic attention is or should be focused. I’m tempted by the tabloid thinking which suggests the banks’ sudden attention to risk is because they spent too much time in the previous years creating a new reality in terms of mortgages-repackaged-as-“securities”. It’s tempting, but I think there’s more to it than that. Marchand’s framework is about knowledge. Lambe, who references it, thinks it misses out two important areas of corporate knowledge, specificially: strategic planning and talent management. As I said, I’ve not yet played with the framework, so I’m reserving my final judgement. However, translating the hierarchy of needs from people to organisations is something well worth doing in these interesting times. Lambe, Patrick Organising Knowledge: Taxonomies, Knowledge and Organisational Effectiveness. Oxford: Chandos Publishing. 2007. Marchand, Donald, (ed) Competing with Information: A Manager’s Guide to Creating Business Value with Information Content. Chichester: John Wiley. 2000.